Equip yourself to make accurate diagnoses and achieve successful treatment outcomes with this highly visual comprehensive atlas. 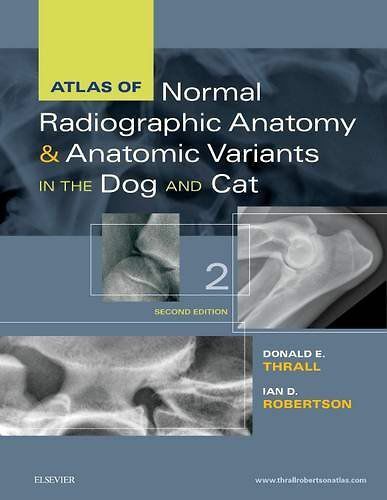 Featuring a substantial number of new high contrast images, Atlas of Normal Radiographic Anatomy and Anatomic Variants in the Dog and Cat, 2nd Edition provides an in-depth look at both normal and non-standard subjects along with demonstrations of proper technique and image interpretations. Expert authors Donald E. Thrall and Ian D. Robertson describe a wider range of "normal" as compared to competing books - not only showing standard dogs and cats, but also non-standard subjects such as overweight and underweight pets and animals with breed-specific variations. Every body part is put into context with a textual description to help explain why a structure appears as it does in radiographs, and enabling practitioners to appreciate variations of normal that are not included, based on an understanding of basic radiographic principles.